We develop tailor-made technological solutions and Geographic Base interfaces driven towards the business processes of our Clients. Solutions that favour the use of market standards through open source software components, operation in Intranet and/or Internet environments and access to an unlimited number of users, providing effective cost and time savings in geographic base operations. We design GeoPortals, both for Public and Private Entities, in order to make existing Geographical Information systematically and orderly available in a portal, having maps as targets. Based on CMS technology, it allows to centralize and manage access given to Intranet and Internet users, as well as to create and organize content, manipulate content layout, automate administrative tasks, and set permissions and roles for users and collaborators. Urban management and supervision is one of the major activity areas in Municipalities, and of utmost importance in land management. We developed this application to support urban management activities, automatizing the legislation and regulation checks. We created this application to enable prior PDM checks, having a certain location in the territory, a rustic building and/or address as a starting point. After designing the claim location, cross-checking with the PDM’s space categories, regulation and restrictions is an automatic procedure, with a simple and user-friendly analysis printing process. This Location Maps application empowers Technicians and Citizens with an automated printing tool of location maps needed for instructing construction works and allotment processes according to the process type. In order to meet the demands on public roads, communication of events by Citizens is an essential condition. For this to happen quickly and easily, we created this application which, via a straightforward filling form and a map to pinpoint the location of the event, allows you to streamline and simplify procedures, increasing total transparency between local authorities and citizens. 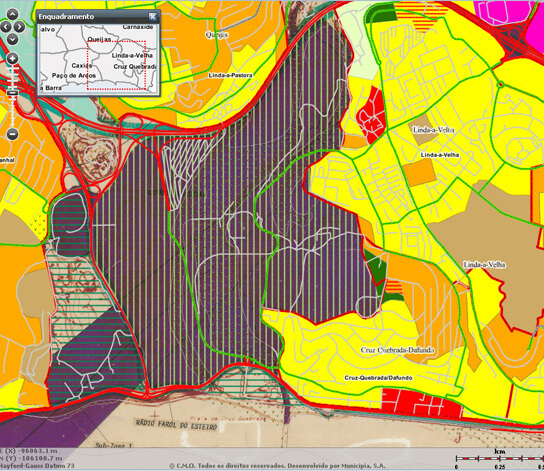 Convenience and operability to the daily managing of all the information related to green areas and tree cadastre management, namely concerning inventory and its evaluation. Operation planning and management are the core aspects of this application. Access to all Municipal Works in progress is now available online, including the work’s main features, namely its expected execution time and cost, with the ability of promoting said works, as well as information about main constraints to vehicle and people circulation until work completion. The Municipal Heritage is managed using this tool, which integrates the research and identification components in the Public and Private Domain of Municipal Councils, as well as the graphic and alphanumeric edition of this inventory. In order to achieve quick and sustained responses from civil protection forces, we have created a geo-referenced event insertion and management platform that includes a risk assessment involving the event, mobilization of vehicles, firefighters and other civil protection forces and communicating the event allocated to each vehicle. This tool streamlines the allocation and management of street toponyms and police numbers by the technical services, because it incorporated the allocation rules and serves the remaining municipal services and/or applications in real time with up-to-date information. Platform designed for efficient real time management of the entire fleet, with sequential queries on vehicle position and routes, as well as updates, averagely every 30 seconds. Access to alerts and reports containing reliable data on routes, speeds, mileage and driver profiles allows you to forecast expenses, consumption and route planning to make them as efficient as possible. Parameterization of reports and alerts. A basic tool designed for managing infrastructure networks, be it water, sanitation or telecommunication networks, on a territorial and interconnection basis with the services to provide. We designed an application for PL network management, with a strong spatial component, allowing you to prioritise actions according to the highest consumption places, the impacts of measures on different land use types and the communication route type. We have developed a WebGIS that allows you to check the building’s solar potential, either by its address or direct identification, being information of public interest that supports users upon deciding whether to install solar panels on their roofs and to meet the goals of the Covenant of Mayors. Access to alerts and reports containing reliable data on routes, speeds, mileage and driver profiles allows us to forecast expenses, consumption and route planning to make them as efficient as possible. UAccess to alerts and reports containing reliable data on routes, speeds, mileage and driver profiles allows you to forecast expenses, consumption and route planning to make them as efficient as possible. Make smart traffic decisions using statistics of all routes, related to speed profiles, travel times, on any day of the week, at any hour of the day, from 2008 to the last 24 hours. 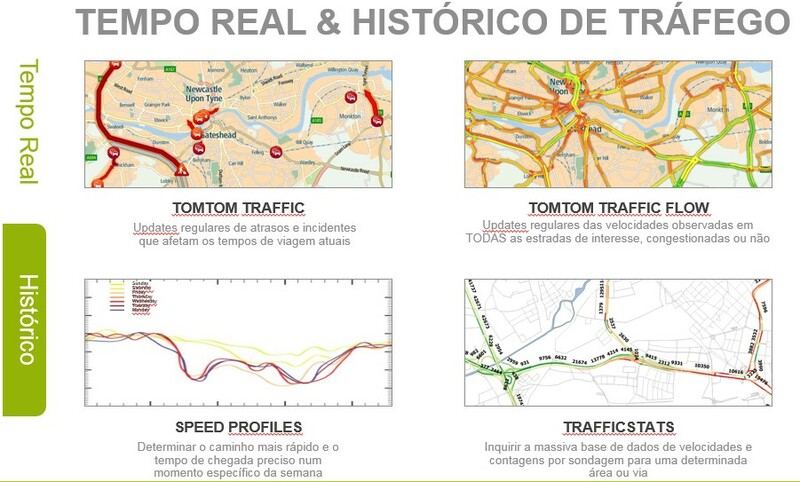 Traffic Speed, Flows and Delays are some of the details you can start using and sharing online in real time. Increase your ability to attract Tourists by creating unique experiences in Augmented Reality, bringing architectural and engineering projects to life; presenting museums by “ancient personalities”; recreating “characters” along tourist routes. Ask us how! We built a WebGIS that provides a systematised database, shaped as a map and organized by themes, so as to easily provide virtual tours of the Municipality. Also in printed format. A quick search by place, street name or address, guarantees locating shops or services, or any other type of economic activity on the map with this application. An application designed to provide statistic information, with features like data search related to a specific geographic area, theme maps production tailored to each user and summary tables of statistic information, allowing to print these documents. Defining the location of a new ATM machine, fuel station, or restaurant is supported through easily viewable map variables.